The first perk of FreeTranslation.com is that the web address is so easy to remember, you can look it up on any computer at any time when you need a quick translation in a pinch! The website is laid out in a simple, straightforward format. In the center of the page is the default free translation option: text, English to Spanish. But there are nine other languages you can choose to translate into: French, German, Italian, Dutch, Portuguese, Russian, Norwegian, Chinese and Japanese. Additionally, if you have some text in one of those languages that you can’t understand, for example, German, simply paste it into the box, choose the “German to English” from the drop-down menu and then hit the “Free Translation” button. You can translate text for free on this site, and you can also translate web pages. For free web translation, simply copy the website address, paste it into the provided box under the “Free Web Translation” tab, and hit the “Free Translation” button. After a few seconds of processing, your browser will open the requested website, except all the text will be in the language you want it in, instead of English. How high of quality are the free translations on FreeTranslation.com? They are usually pretty good, especially if you choose very simple English to be translated. If you enter English idioms and complex phrases, don’t expect to come out with a perfect translation into Chinese or Spanish. Machines can do translation, but they will never be able to give the flawless, natural and beautiful translation that a person can give into the language they speak. So, for a free resource, FreeTranslation.com is great. But it has the shortcomings that any translation software has: it is only a machine. When it comes to more high-quality, human translation, you cannot get it free from FreeTranslation.com. If you want a person to translate your text/website/paper/other document for you, you will have to pay for it. But at least you can get a free bid on FreeTranslation.com, which gives you an idea how much you can expect to spend to have a translation made of your material. Once you click to get a bid, though, you are actually transferred to the sister site Click2Translate.com. The professional, human translation services on Click2Translate.com are offered for a plethora of languages: Afrikaans, Albanian, Arabic, Armenian, Bengali (Bangla), Bosnian, Bulgarian, Chinese, Croatian, Czech, Danish, Dutch, Estonian, Farsi, Finnish, French (Canada and France varieties), German (Austria and Germany varieties), Greek, Gujarati, Hebrew, Hindi, Hmong, Hungarian, Icelandic, Indonesian, Italian, Japanese, Kazakh, Korean, Kurdish, Latvian (Lettish), Lithuanian, Macedonian, Malay, Norwegian, Polish, Portuguese (Brazil and Portugal varieties), Punjabi, Romanian, Russian, Serbian, Sesotho, Slovak, Slovenian, Somali, Spanish (Latin America and Spain varieties), Swahili, Swedish, Tagalog, Tamil, Thai, Turkish, Ukrainian, Urdu, Vietnamese, Welsh and Zulu. To get an estimate for translation of a document, click on the "Professional Translation" tab. Indicate whether the text is "Personal," "Business (Standard)," or "Business (Specialist)." Upload the document you wish to translate (hint: save the document in rich text format to preclude any problems with uploading it). Indicate which language you wish to translate from, and which language you want to translate into. At this point, you will be transferred to the Click2Translate.com website, where you will see a bid for "Translation Only" and a bid for "Translation and Proof." The rates will vary, depending on the length of the document, the technicality of the language, and the language you are translating into. To translate this article into Thai, I was given a bid of $50.00 – $60.00. 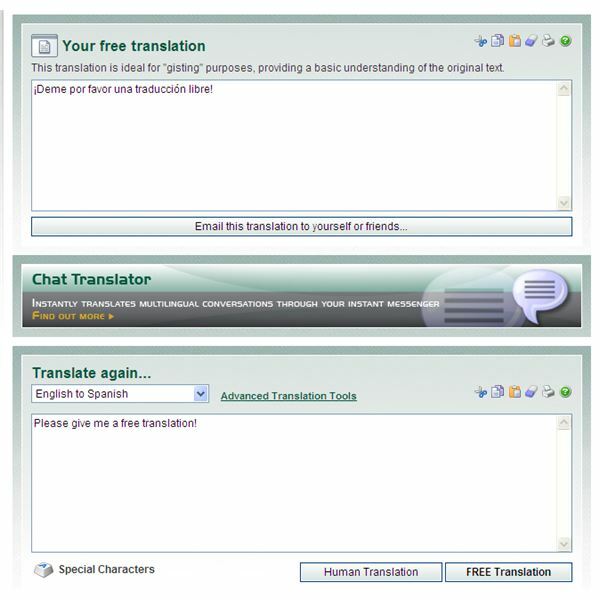 Besides offering free machine translation into and from ten world languages, and linking to a human translation resource, FreeTranslation.com also has a “Shop” where you can buy other helpful translation resources: these include a Desktop Translator (less than $3.50 per month), a Clipboard Translator (also less than $3.50 per month), an SDL Chat Translator (less than $5.00 a month) and other freebies. Because it offers quick, free, helpful resources, as well as links to paid, more professional translation resources, FreeTranslation.com is a great site for anybody looking for translation help. It can meet the budget and the expectations of a variety of translation needs.